Do some cultural sightseeing at The Disney Gallery and Mission San Juan Capistrano. Head to The Lego Store and Irvine Spectrum Centerfor plenty of shopping. Explore Anaheim's surroundings by going to The Queen Mary (in Long Beach), Birch Aquarium at Scripps Institution of Oceanography (in La Jolla) and Balboa Island Museum & Historical Society (in Newport Beach). There's much more to do: wander the streets of Little Arabia District, get engrossed in the history at Founder's Park, get a taste of the local shopping with South Coast Plaza, and take in the architecture and atmosphere at Christ Cathedral. To see other places to visit, more things to do, photos, and tourist information, go to the Anaheim road trip planning app . London, UK to Anaheim is an approximately 16-hour flight. You can also do a combination of flight and train; or do a combination of flight and bus. The time zone changes from Greenwich Mean Time (GMT) to Pacific Standard Time (PST), which is usually a -8 hour difference. Expect somewhat warmer temperatures when traveling from London in June; daily highs in Anaheim reach 32°C and lows reach 20°C. Wrap up your sightseeing by early afternoon on the 6th (Thu) to allow time for travel to Glenwood Springs. On the 7th (Fri), let the river carry you with a rafting and tubing tour and then test the waters at a local thermal spa. For reviews, traveler tips, where to stay, and tourist information, go to the Glenwood Springs road trip planner . Do a combination of bus and flight from Anaheim to Glenwood Springs in 6 hours. Alternatively, you can do a combination of bus, flight, and shuttle; or drive. Due to the time zone difference, you'll lose 1 hour traveling from Anaheim to Glenwood Springs. Traveling from Anaheim in June, things will get a bit cooler in Glenwood Springs: highs are around 22°C and lows about 9°C. Wrap up your sightseeing on the 8th (Sat) early enough to drive to Denver. Get some cultural insight at Denver Botanic Gardens and Denver Art Museum. Take a break from the city and head to River Rafting & Tubing and Denver Zoo. Go for a jaunt from Denver to Boulder to see Pearl Street Mall about 34 minutes away. The adventure continues: see the sky in a new way at Denver Museum of Nature & Science, look for gifts at Tattered Cover Bookstore, wander the streets of 16th Street Mall, and get a sense of history and politics at Colorado State Capitol. For ratings, other places to visit, and more tourist information, refer to the Denver itinerary builder website . You can drive from Glenwood Springs to Denver in 3 hours. Alternatively, you can take a bus; or do a combination of bus and flight. Traveling from Glenwood Springs in June, things will get a bit warmer in Denver: highs are around 33°C and lows about 15°C. On the 10th (Mon), wrap the sightseeing up by early afternoon so you can travel to Miami. Do your shopping at Lincoln Road and Ocean Drive. Your cultural itinerary includes sights like Collins Avenue and Freedom Tower. Take a break from Miami with a short trip to Shark Valley in Everglades National Park, about 1h 05 min away. 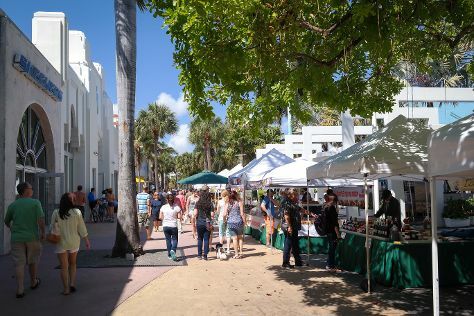 There's much more to do: kick back and relax at South Beach, see the interesting displays at Vizcaya Museum and Gardens, appreciate the extensive heritage of Art Deco Historic District, and buy something for everyone on your list at Bayside Marketplace. To see maps, photos, reviews, and more tourist information, read our Miami trip itinerary maker . Traveling by flight from Denver to Miami takes 7 hours. Alternatively, you can do a combination of flight and bus; or drive. The time zone difference when traveling from Denver to Miami is 2 hours. When traveling from Denver in June, plan for a bit warmer days in Miami, with highs around 37°C, while nights are warmer with lows around 29°C. Finish up your sightseeing early on the 13th (Thu) so you can travel to Washington DC. Get a sense of the local culture at National Air and Space Museum and Madame Tussauds DC. Step out of the city life by going to National Zoological Park and Antietam National Battlefield. When in Washington DC, make a side trip to see Horseshoe Casino in Baltimore, approximately 1 hour away. There's more to do: explore the world behind art at National Gallery of Art and contemplate the waterfront views at Tidal Basin. For photos, traveler tips, and more tourist information, refer to the Washington DC day trip tool . Traveling by flight from Miami to Washington DC takes 4.5 hours. Alternatively, you can do a combination of flight and train; or drive. Traveling from Miami in June, you can expect nighttime temperatures to be slightly colder in Washington DC, with lows of 24°C. Wrap up your sightseeing on the 16th (Sun) early enough to travel to Niagara Falls. You've now added Niagara Falls to your itinerary. On the 17th (Mon), admire the sheer force of Niagara Falls, then get some fabulous bargains at Fashion Outlets of Niagara Falls, USA, then steep yourself in history at Frank Lloyd Wright's Darwin D. Martin House Complex, and finally explore the fascinating underground world of Cave of the Winds. Keep things going the next day: see the interesting displays at Niagara Falls Underground Railroad Heritage Center and then try your luck at Seneca Niagara Casino. To see reviews, other places to visit, where to stay, and more tourist information, refer to the Niagara Falls day trip planner. You can do a combination of flight and bus from Washington DC to Niagara Falls in 4.5 hours. Alternatively, you can do a combination of train, flight, and bus; or drive. Expect a bit cooler temperatures when traveling from Washington DC in June; daily highs in Niagara Falls reach 29°C and lows reach 17°C. Wrap up your sightseeing on the 18th (Tue) early enough to travel to Chicago. Start off your visit on the 19th (Wed): explore the world behind art at The Art Institute of Chicago, get a taste of the local shopping with The Magnificent Mile, and then admire the striking features of Chicago Cultural Center. Keep things going the next day: make a trip to Cloud Gate, appreciate the extensive heritage of Millennium Park, and then admire nature's wide array of creatures at Lincoln Park Zoo. To see ratings, traveler tips, more things to do, and more tourist information, read Chicago attractions site . You can do a combination of bus and flight from Niagara Falls to Chicago in 5 hours. Alternatively, you can do a combination of train and flight; or drive. The time zone difference moving from Eastern Standard Time (EST) to Central Standard Time (CST) is minus 1 hour. June in Chicago sees daily highs of 32°C and lows of 20°C at night. Finish up your sightseeing early on the 20th (Thu) so you can travel back home.